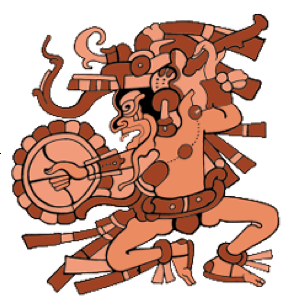 Ek Chuah is the sixth most commonly depicted deity in the codices, and is portrayed 40 times. He has a thick, pendulous lower lip and is generally painted in black, in the Tro-Cortesian codex, or partially black, in the Dresden codex. His mouth is always surrounded by a dull red circle which makes his thick lips stand out. The hieroglyph of his name is an eye with a black ring. He was the beneficial god for traveling merchants. As a beneficent god, he appears carrying a bundle of goods on his back, like a traveling merchant, and in some places he is shown with the head of Xamán Ek, god of the North Star, who, as we will see, is said to have been “The Merchants’ Guide”. Finally, Ek Chuah was the patron of cacao, and the owners of plantations of this crop conducted a ceremony in his honor in the month of Muán. This god was a friend to the Maya. It should be noted that Mayan commerce extended from Xicalango, on the Laguna de Terminos on the Gulf of Mexico, to the mountains of Chiapas, and along the Caribbean coast as far as Honduras. It continued after the collapse of the Mayan Empire until the arrival of the Spaniards. The principal Mayan god of merchants was Ek Chuah (ek means “star” and chuah means “black” in Yucatec Maya), who was also the god of cacao. The connection lies in the fact that cacao seeds were used as currency throughout Meso-America. Fray Diego de Landa reports that as special ritual travelers as well as merchants would bring out incense every night in order to arrange three stones with several grains of incense on top, and place incense on another three flat stones arranged in front of the first three, praying to Ek Chuah to bring them home safe and sound.